The artist’s name alone shows that Karin Rabhansl is from Bavaria, although people from Nuremberg see themselves rather as Franks than as Bavarians. Her music lies somewhere between pop, rock, folk and singer/songwriter. The most intriguing bit about it is that she uses a Southern German dialect that sounds quite different from standard German. 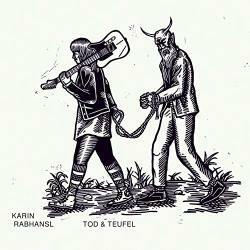 Tod & Teufel is so far Karin Rabhansl’s hardest rocking album, and in my opinion also her most exciting and entertaining one. The opener is a rather unusual choice, because Wenn’s dir a Freid macht is a cover version of Sheryl Crow’s If It Makes You Happy. After this catchy introduction, things get a little harder. The midtempo rocker Dieses Heulen is a rather dark piece but is still quite memorable. Up next is the pre-release single Wenn i doad bin, where Karin Rabhansl lets her anger run wild. The cool organ sounds give this song everything to become a hit. The inconspicuous acoustic Aloa is a bit of a letdown, and the mystic, dreamy Lychtal also lacks a little excitement. Karin Rabhansl shows that she has an adept hand at picking cover versions with 60 Watt Sonne, originally from Keine Zähne im Maul Aber La Paloma Pfeifen. My favourite track is Erwachsen with which I can identify quite a lot and which furthermore puts quite the punch into the music. Karin Rabhansl shows throughout the running time of over fifty minutes that she is quite the varied musician. Tod & Teufel is a really strong album full of mood changes. I do like some tracks more than others, but I never felt tempted to skip to the next track. I can well imagine that she might reach quite a broad audience with her music.